Action Write Tag - Phatch = PHoto & bATCH! 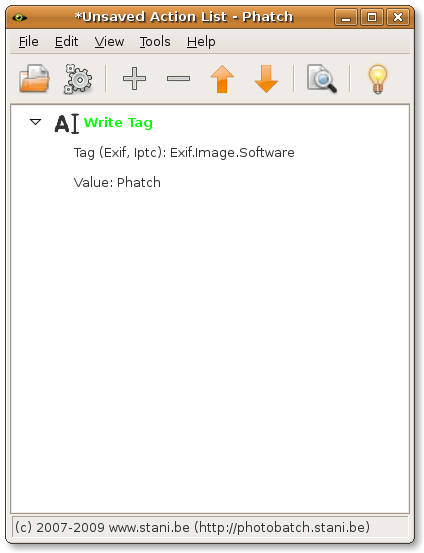 The name of the exif or iptc tag. It should always start with "Exif." or "Iptc.". You can copy and paste names from the Image Inspector. The new value of the tag. You need to be careful to enter values in the right format. For example: the tag "Exif.Image.DateTime" should have a value with a similar format as "2008-05-05 11:42:34". If you leave the value empty, it will delete the tag from the image. You can use here all the <variables>, which are displayed in the Image Inspector. If you want to save the geodata without altering the image, choose the Save Metadata action instead of a normal Save action.